rocky's bru: So, Tong, did you or didn't you? 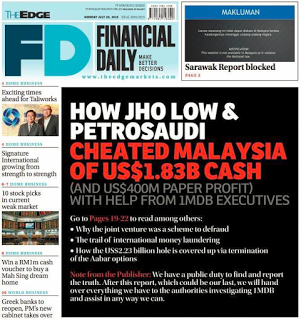 The Edge's Financial Daily did a front page drama today on how we Malaysians had supposedly been cheated US$1.83 billion cash by PetroSaudi and Jho Lo in 2009. To some, the front page has made Edge owner Tong Kooi Ong a hero. But to blogger Lim Sian See, it is just The "final kopek" for Tong and The Edge?. "The Edge's final desperate roll of the dice is to accuse, Saudi Royal family member, KPMG, Deloitte, Ernst & Young and the Abu Dhabi government of conspiring with Malaysian govt to cheat Malaysians." The 1MDB called it "irresponsible reporting" and "unnecessary sensationalism". "We are surprised that these old and unproven allegations are being recycled yet again." Some of you will be asking, So what happened to the missing RM42 billion? The missing RM27 billion? The missing USD700? In the Edge and Tong's final analysis, Jho Lo with the Abu Dhabi government and the Malaysian government had committed international fraud in Singapore to cheat Malaysian public money. If this is true surely Singapore, the bastion of transparency, will be able to prove it and send them all - Jho Lo and gang - to rot in jail? Malaysians have full faith in Singapore justice system, what! And by the way, what was the issue with Prime Minister Najib Razak then? After all these months of implied accusations of Najib's "involvement ", none of their documents seem to carry any proof. It's all about Jho Lo, isn't it? Me, I have only ONE question for Tong: Did you pay Justo for his information? (Sepuloh Budak Hitam, Big Dog). Something's happened to you Rocky: you've turned decidedly polemical and blunt. A typical reporters, both sides, favoring & biasness in their reporting. One is supporting this side, the other on that side. Interesting to see, the truth will prevail. Me, I have only ONE question for you: Are you getting paid by the govt to perform lazy cut & paste exposes into your half-dead blog? PS: " And by the way, what was the issue with Prime Minister Najib Razak then? After all these months of implied accusations of Najib's "involvement ", none of their documents seem to carry any proof. It's all about Jho Lo, isn't it?" The Petrosaudi story just makes your paymaster look incompetent. That 2.6 billion in AmBank makes him look like a crook. You and Tun Faisal should be cellmate one day and perhaps can compare notes on how both of you bend over backwards to defend Najib and Rosmah. Poorah locky!!! Sock it to them bro! You are the man. What happened to A Voice? Looks like he has slowed down defending Najib. Whats left of the ingrates are you, bujai and bigdog. Barking magpie has been quite almost a month. I wonder does it cost to make three of you sell your soul? Perhaps not much because by the looks of it it does not cost much at all as the soul's are worthless anyway!! Spin Rocky jangan tak spin..Too bad not too long ago this page once one of the most respectable socio-political blog in the country. Now it has turned into some sort of propaganda mouthpiece. The Edge and its owners have been silently assassinating the BN govt for a while without being too direct. They have bought on-line and print news organizations (the MM and the MI for example) to spearhead their propaganda. They would not be doing this for charity but expect a very good return. With Pakatan's failure in GE13, they cannot afford to wait for GE14. Thus the idiotic Kajang Move was born but everyone knows how that turned out to be. I think there are many more puppet masters behind this plot and in due course all these will fall apart and truth will emerge. It is interesting to note that despite daily attacking Najib and 1MDB for not denying the allegations hurled, The Edge and Tony Pua seemed to be strangely silent themselves about the serious allegations made by Justo and the Thai police. I see the owners of the Edge, a number of reporters and Pakatan leaders heading for a long holidays to Thailand courtesy of the HRH of Thai King. I think you are missing the point. It's not about whether the information is paid for or not. It's whether it is true. Unfortunately we Malaysians so far has not seen any form of evidential rebuttal which says otherwise. At this stage, a mere verbal denial would not cut it anymore. 1MDB will be long gone. desperate times call for desperate (reporting) measures rocky. or are you paid to not ask the obvious? 'Final kopek' ,irresponsible reporting, conspiracy, big lie , sabotage, call them whatever. The gist is they have all done enough damage to discerdit the PM and the Malaysian Govt. More and more members of the Malaysian public believe what they read. Any attempt to defend the PM and Govt is futile unless concrete action is taken such as an outright denial or a suit against the TE , SR , WSJ and all the media who had published these so called lies and fake evidences. Only in the court of law will truth prevail from real evidences. If not then this psy war will just go on and on. I agree mere rebuttal is not enough but neither mere allegation is enough either. That's the whole point of the investigations done by AG and the STF. Anyone who is interested in exposing the truth would have provided the evidence to an independent party and not keep making unproven and unsubstantiated allegations using the internet where it is easy to fabricate and lie. I have challenged Claire to submit all evidence to an independent 3rd party in the UK or the UK police as some of the alleged crimes took place there and PSI is based there as well. But she refused. That itself is a red flag. Sue la. Takkan cakap - cakap je. 1MDB.TH.MARA.Felda.Umno..and lately PAS telah mula dibenci olih orang melayu.Senario GE14. 60% malay/bumi and 40% non malay. 30% malay sudah benci melayu. 30+40=70%....WOW. I thing the puppet master has won half of the battle. For the malay they can only blame themselve. Singaporian malay! To those who wished Najib to be overthrown undemocraticlly,ask yourselves why till now,its July already he is still the PM.You all were not patience enough,when given answers refused to to accept,trusted foreign media more than locals,loved perceptions and manipulations of distorted info.When someone or bloggers defend the govt,started to namecallings or being paid.What do you aspect,will Najib confessed to the whole world whatever he had done or not done.So keep on barking and I tend to agree with 12.54 statement above. What's wrong if they paid for it being a publication ? Any better than paying a pathetic man to do a video confession ? I think better pay for a blue film ! Rocky....dia orang takut....finally they admit that they meet and buy the information. Dengan segala jentera yang ada, dengan segala kuasa yang ada.... dia masih gagal menjelaskan keadaan. Dia sebenarnya gagal untuk memimpin.